I love a good story. Always have, always will. A few years ago, I met Herman. He for sure had a captivating story to share: he talked about survival in changing times. His vision, inspirational talks and award-winning books on transformation and happy profit were striking a chord. Not just with me, but with many other professionals even so. When we first met, I just sold my communication agency (specialized in public relations, social influencers and engagement) to an international group. For the first time in years, I had a bit of breathing room and I was taking the time to understand why so many of my clients were slowly but surely loosing grip. The dominant business and engagement models didn't cut it anymore, the ROI of great, creative campaigns was getting too low. That's when and where I decided to dive into the domain of purpose. Embracing purpose has changed my life deeply. 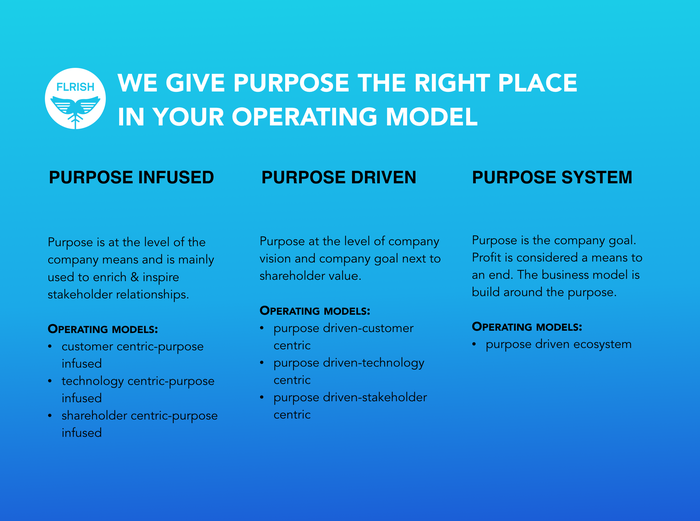 I married Herman (best move ever) and started analyzing why and how purpose-driven companies were outperforming others. It resulted in new engagement and business models that have proven to work. I still buy and wear nice shoes and I do like to make good money - but not at any cost. 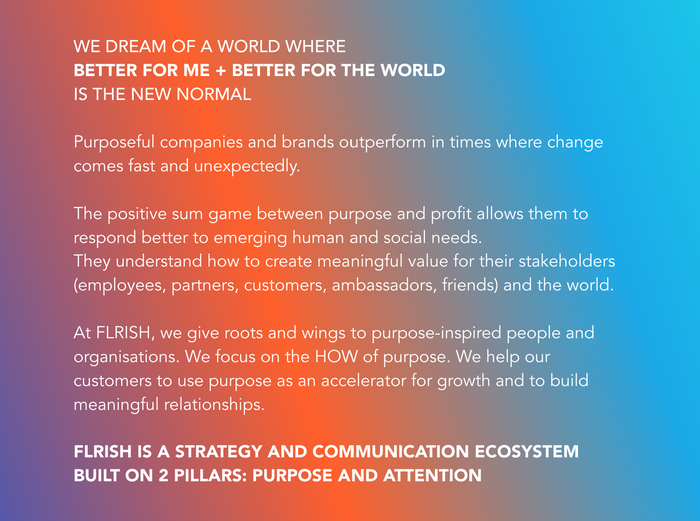 I choose to invest time and love in businesses and brands that combine 'better for me + better for the world' - or want to make the purpose switch. That is why FLRISH saw the daylight. 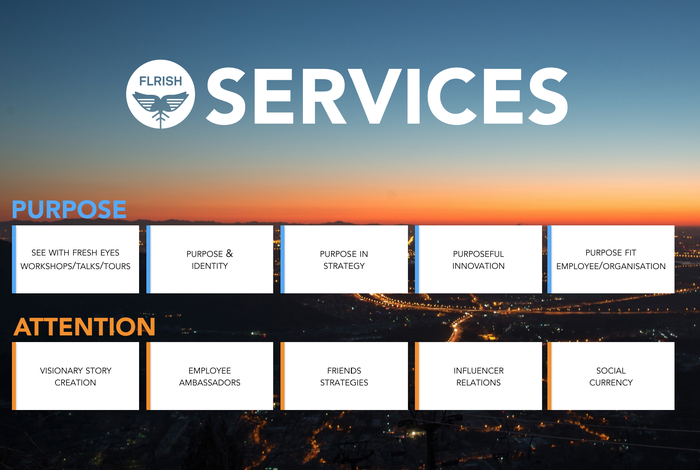 Our international ecosystem brings the brightest minds together to make purpose-driven people and organizations flourish, using new business and engagement models. Ann lives between Antwerp (Belgium) and Amsterdam (The Netherlands). She is married to Herman and is proud to mother 5 amazing kids. She loves to 'keep her head, heels and standards high'. Marketing: it was love at first sight. After an introductory course at university, I knew that I wanted to be a marketeer. My passion for marketing grew into a career of a lifetime. One that I’m proud of: I love being a marketeer. My unconditional love for marketing had it ups and downs. Around 2011 it reached an all-time low. There seemed to be so little left to love about my job. It felt like it was ‘just about the money’. It felt like manipulation: selling too many things to people that didn’t need it. Fueled by the birth of my children, I decided to redefine the game I loved so much. I left on a long journey to find ways to reconnect ‘doing good things that truly matter’ with successful marketing. I reflected my journey in 2 books and a long string of seminars, conferences and workshops. Along the way I met some amazing people and found my voice. ‘Purpose’ is what makes me go to work with a smile every morning. All good things come in pairs. Just when I felt that I got my head round ‘purposeful business and marketing’ I met my wife-to-be: Ann. She made me land. Her passion and insights allowed me to define models to put the HOW of purpose in motion. It’s great knowing how to rewire organizations and marketing plans, it’s even better to bring them to life and see people embracing it. We are ambitious at FLRISH. We are riding a fantastic wave that allows us to build meaningful relations and create value that matters. 'Better for me+better for the world' is our religion. We are blessed: amazing people have found their way to our ecosystem. We are proud of our partners, of our clients and the work we do for them. 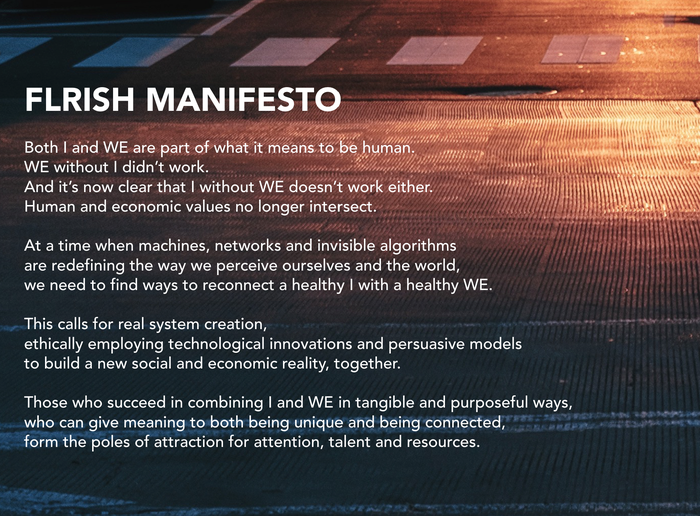 Every step we take is one closer to making 'better for me+better for the world' the new normal. Herman lives between Antwerp (Belgium) and Amsterdam (The Netherlands). He is married to Ann and is proud to father 5 amazing kids.